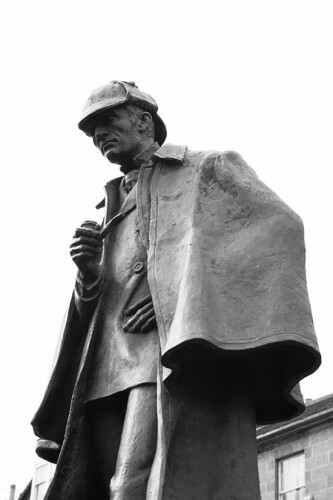 The Edinburgh Statue of Sherlock Holmes. Photo by Siddharth Krish. CC-BY-SA 3.0 via Wikimedia Commons. The canonical understanding of scientific reasoning insists that theory confirmation be based exclusively on empirical data predicted by the theory in question. From that point of view, Holmes’ method may at best play the role of a side show; the real work of theory evaluation is done by comparing the theory’s predictions with empirical data. Actual science often tells a different story. Scientific disciplines like palaeontology or archaeology aim at describing historic events that have left only scarce traces in today’s world. Empirical testing of those theories always remains fragmentary. Under such conditions, assessing a theory’s scientific status crucially relies on the question of whether or not convincing alternative theories have been found. Just recently, this kind of reasoning scored a striking success in theoretical physics when the Higgs particle was discovered at CERN. Besides confirming the Higgs model itself, the Higgs discovery also vindicated the judgemental prowess of theoretical physicists who were fairly sure about the existence of the Higgs particle already since the mid-1980s. Their assessment had been based on a clear-cut no alternatives argument: there seemed to be no alternative to the Higgs model that could render particle physics consistent. Similarly, string theory is one of the most influential theories in contemporary physics, even in the absence of favorable empirical evidence and the ability to generate specific predictions. Critics argue that for these reasons, trust in string theory is unjustified, but defenders deploy the no alternatives argument: since the physics community devoted considerable efforts to developing alternatives to string theory, the failure of these attempts and the absence of similarly unified and worked-out competitors provide a strong argument in favor of string theory. These examples show that the no alternatives argument is in fact used in science. But does it constitute a legitimate way of reasoning? In our work, we aim at identifying the structural basis for the no alternatives argument. We do so by constructing a formal model of the argument with the help of so-called Bayesian nets. That is, the argument is analyzed as a case of reasoning under uncertainty about whether a scientific theory H (e.g. string theory) is right or wrong. A Bayes nets that captures the inferential relations between the relevant propositions in the no alternatives argument. 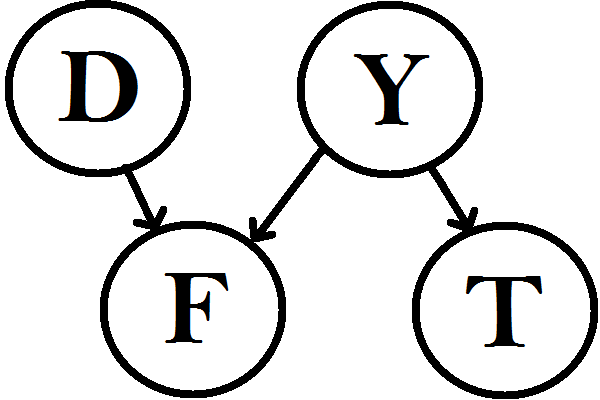 D=complexity of the problem, F=failure to find an alternative, Y=number of alternatives, T=H is the right theory. We argue that the failure of finding a viable alternative to theory H, in spite of many attempts by clever scientists, lowers our expectations on the number of existing serious alternatives to H. This provides in turn an argument that H is indeed the right theory. In total, the probability that H is right is increased by the failure to find an alternative, demonstrating that the inference behind the no alternatives argument is valid in principle. There is an important caveat, however. Based on the no alternatives argument alone, we cannot say how much the probability of the theory in question is raised. It may be substantial, but it may only be a tiny little bit. In that case, the confirmatory force of the no alternatives argument may be negligible. The no alternatives argument thus is a fascinating mode of reasoning that contains a valid core. However, determining the strength of the argument requires going beyond the mere observation that no alternatives have been found. This matter is highly context-sensitive and may lead to different answers for string theory, paleontology and detective stories. Richard Dawid, Stephan Hartmann, and Jan Sprenger are the authors of “The No Alternatives Argument” (available to read for free for a limited time) in the British Journal for the Philosophy of Science. Richard Dawid is lecturer (Dozent) and researcher at the University of Vienna. Stephan Hartmann is Alexander von Humboldt Professor at the LMU Munich. Jan Sprenger is Assistant Professor at Tilburg University. Their work focuses on the application of probabilistic methods within the philosophy of science. For over fifty years The British Journal for the Philosophy of Science has published the best international work in the philosophy of science under a distinguished list of editors including A. C. Crombie, Mary Hesse, Imre Lakatos, D. H. Mellor, David Papineau, James Ladyman, and Alexander Bird. One of the leading international journals in the field, it publishes outstanding new work on a variety of traditional and cutting edge issues, such as the metaphysics of science and the applicability of mathematics to physics, as well as foundational issues in the life sciences, the physical sciences, and the social sciences. Interesting, but in my opinion flawed. Just because there was no alternative theory (at the time) to explain day and night other than the sun moving relative to the caveman’s fixed position, does not mean that that theory was right. The factor of the intelligence and experience of the theorist is key.. and there is no reason to think that Humans are smart enough to fully understand the mechanisms that we map out with maps and models like string theory. No, Kieran, I don’t think your example negates the sound argument. In fact, the chances of the sun orbiting the earth were indeed increased as other theories were ruled out due to no evidence. Other theories may have included, for example, a chariot or cosmic creature pulling the sun across the sky. Once scientists ruled these out, the sun-orbit theory legitimately increased in likelihood…and indeed is closer to the truth than the chariot theory. The fact that it eventually proved wrong does not refute the argument proffered by Dawid et al.